Hop aboard a train for leaf peeping this fall and leave the driving to someone else. 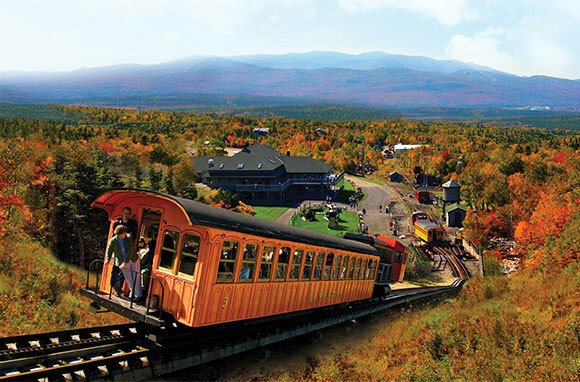 These 10 affordable fall foliage train rides give terrific views of brilliant pockets of color throughout North America. So forget the GPS directions, the seat belt, and the gas gauge. Settle into a historic dining car with a glass of wine, or stake out a spot for you and your camera in an open-air car. Let the stress-free gawking begin. Every September in New Hampshire's White Mountains, fall-color predictions are the talk of coffee shops, and TripAdvisor buzzes with enthusiastic Mt. 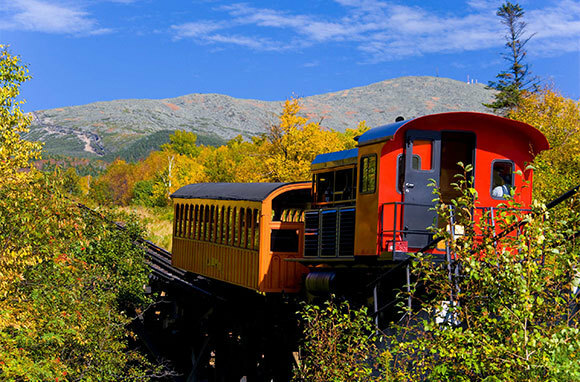 Washington Cog Railway posts about the view from the top of the Northeast's highest peak. This popular 144-year-old railway carries passengers via biodiesel engine or vintage steam engine with replica coaches up a three-mile-long trestle to the 6,288-foot summit. Here you'll see the surrounding national forest's brilliant hues from some of the steepest railroad tracks in North America (37 percent grade in one stretch). The View: On the ride up, the landscape and foliage change with the elevation. From the summit, you can take in panoramas of the mountains and valleys from New Hampshire to Vermont and, on clear days, as far as Maine and Canada. Peak Color: Usually late September through the second week of October. Check the fall foliage report for the latest predictions. Cost: $64 per adult for the three-hour excursion, with one hour at the summit. Originally constructed in 1881 to haul silver and gold ore from mining camps in the San Juan Mountains, the Durango & Silverton Narrow Gauge Railroad soon became popular for its awe-inspiring views. And the dramatic scenery hasn't changed much since the days claim-seeking miners rode the line. 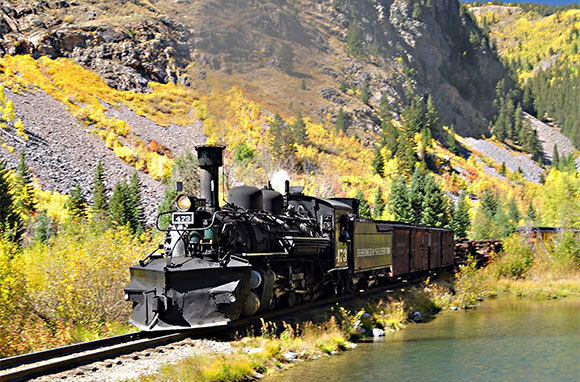 Hug cliff edges and descend into valleys as you make your way from the remote wilderness of Durango to the mining town of Silverton on this historic coal-fired steam train. In late October, the Peanuts Great Pumpkin Patch Express is popular with families. The View: See autumn's golden and crimson hues set among the majestic peaks of the San Juan Mountains and along the Animas River. Peak Color: Usually late September through mid-October. Check the fall foliage report for the latest updates. Cost: $85 per adult for the day-long excursion, with departures throughout October. $32 per adult and $24 per child for the Peanuts Great Pumpkin Patch Express ride, with departures throughout October. The sound of the steam locomotive's whistle and the smell of its burnt-coal smoke have turned many a New England leaf peeper into a hopeless romantic or wistful nostalgic. 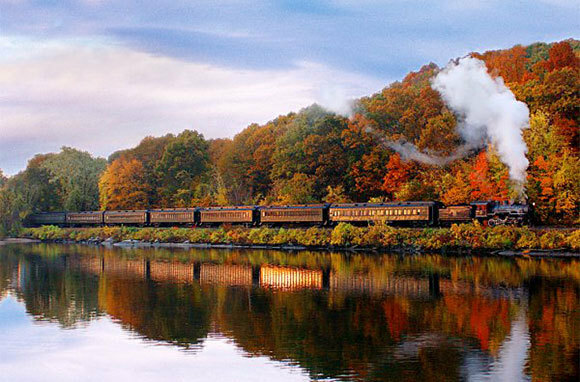 On the Essex Steam Train & Riverboat excursion, a 1920s steam locomotive whisks you through the Connecticut River Valley over rivers and creeks and through the woods on a narrated ride before connecting with an open-deck Mississippi-style riverboat. You'll float past the Gillette Castle, the Goodspeed Opera House, and the Haddam Swing Bridge, all festooned in the season's brilliant colors. The View: See quintessential New England towns and the picturesque countryside. The route crosses trestles and bridges to the tidal wetlands of Pratt Cove and Chester Creek, where there are excellent opportunities for bird-watching. Peak Color: Usually October through mid-November. Check the fall foliage report for current color predictions. Cost: $26 to $36 per adult for the 2.5-hour train and riverboat connection. Ride in coach class, in first class, in an open car, or in the caboose. Fall foliage departures are Thursdays through Mondays, October 3 through 27. Fall in the Napa Valley is one of those unexpected sensory delights. During harvest season, the air carries the aroma of fermenting grapes, and changing leaves on grapevines cover the undulating landscape. The Napa Valley Wine Train is a great way to experience it without having to drive. The 36-mile trip takes you from the historic town of Napa through the countryside to the village of St. Helena and back. 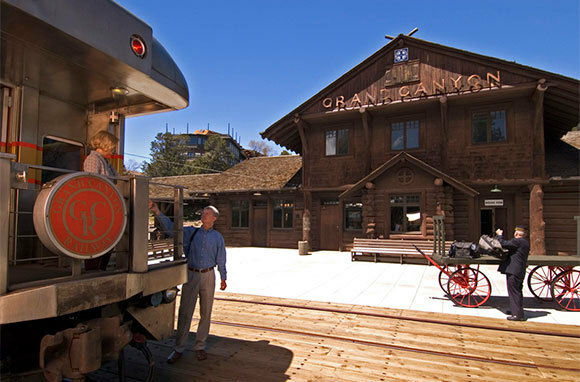 Enjoy vineyard views, wine tastings, and an onboard multi-course lunch or dinner in a restored early-1900s Pullman car. You also have the option to add on winery tours. The View: Pass through five small towns, and, in between, see the entire valley blanketed in yellows and oranges as the grape leaves take on fall colors. Peak Color: Usually throughout September and October. Check the fall foliage report for the latest predictions. Cost: $99 and up per adult. The three-hour trip includes lunch and departs daily throughout October and November. On the Adirondack Scenic Railroad's Fall Foliage Train, see the hidden beauty of the Adirondacks that is not accessible by road. This upstate New York ride through Oneida County takes you through remote forests and past tranquil ponds and streams. At the Thendara Station stop, you can catch a shuttle bus to explore the nearby Old Forge. For the over-21 crowd, the railroad runs a Saturday Beer & Wine Tasting Train at sunset throughout autumn. The train departs from the Lake Placid Station and each ride features refreshments from a different Finger Lakes winery and New York brewery. The View: From the open-air car, take photos of brilliant foliage along sparkling rivers. Watch for animals and birds along the route. Peak Color: Usually mid-September to late October. Check the fall foliage report for the latest colors and predictions. Cost: $37.50 per adult for the Fall Foliage Train, with Thursday and Saturday departures through October 19. $25 per adult for the Beer & Wine Tasting Train, with Saturday evening departures through October 19. Climb aboard on the Blue Ridge Scenic Railway in downtown Blue Ridge's historic 1905 depot, and ride the rails from the charming mountain village into the lush Chattahoochee National Forest. You'll stop for a layover in the Georgia/Tennessee border towns of McCaysville and Copperhill, where antique and craft shops and down-home hospitality take you back in time. Back onboard, ask a crewmember to show you around the cars and explain the history behind each one. Grab some popcorn or hot chocolate before you disembark, and be sure to introduce yourself to the engineers giving tours of the engine at the end of the trip. The View: See vibrant displays of sweeping color along the scenic Toccoa River. Peak Color: Usually throughout October. Check the fall foliage report for current conditions and the latest color predictions. Cost: $46 per adult and $25 per child for the four-hour Fall Leaf Excursion (3.5 hours on Sundays) throughout October. Winding through the 33,000-acre Cuyahoga Valley National Park, the Cuyahoga Valley Scenic Railroad takes you along scenic stretches of fall color just 15 miles outside of Cleveland. Passengers can hop on or off at any of nine stations to explore small towns, canal museums, and a 19th-century working farm. The route runs along several miles of the smooth Ohio and Erie Canal Towpath Trail. For $3, you can put your bike on the train, ride a few stops, then bike back to your car. In October, try the railroad's five-course brunch, haunted tours, and the Pumpkin Express excursion, which takes you to a pumpkin patch and corn maze at Szalay's Farm. The View: See blazing colors around the meadowlands, rivers, and ravines that are home to beavers, foxes, deer, and owls. Peak Color: Usually early October. Check the fall foliage report. Cost: $18 per adult for the three-hour round-trip through the national park. The train runs Wednesdays through Sundays in October. Less than a 90-minute drive from Tennessee's Pigeon Forge and Gatlinburg, the Great Smoky Mountains Railroad's Nantahala Gorge trip follows a historic rail line through mountain tunnels on a beautiful fall foliage excursion. While chugging along a ridgeline in an open-air or enclosed car, you'll hear bluegrass music and Appalachian stories. The railway's Peanuts Pumpkin Patch Express route is a family favorite, with an onboard narration of It's the Great Pumpkin, Charlie Brown and the chance for kids to pick a pumpkin, take a wagon ride, or meet Snoopy. The View: See rich auburns and buttery yellows reflected in the water as you cross over Fontana Lake, then trace the winding river through the mountains. Peak Color: Usually mid-October through mid-November, with the best color during the last week of October. Check the fall foliage report. Cost: $55 per adult and $31 per child for the 4.5-hour Nantahala Gorge excursion, with daily departures in October. $55 per adult and $31 per child for the Peanuts Pumpkin Patch Express excursion, with Friday, Saturday, and Sunday departures in October. Forget the stereotype that Arizona is all desert and rattlesnakes. This October, the state's tourism magazine ran a cheeky cover story claiming that autumn in Arizona is better than in Vermont—and that Arizona's reds and yellows hang around longer. See some of the state's most vibrant colors just outside Williams, near Flagstaff, on the Grand Canyon Railway. The railway is known for its daily trips to the South Rim, but a less expensive option is the line's special Pumpkin Patch ride in October, which takes families to a secret pumpkin patch that's only accessible by train. Back at the depot, enjoy fall-themed crafts and games, plus caramel apples and hot apple cider. The View: See brilliant pockets of yellow aspens tucked within forests of ponderosa pine, Douglas fir, and spruce in and around Kaibab National Forest. Peak Color: Usually late September and early October, but in some areas, the color lasts through November. Check the fall foliage report for details. Cost: $20 per adult and $15 per child for the 75-minute Pumpkin Patch excursion, with departures on Saturdays and Sundays in October. See the blazing glory of fall in the Canadian countryside just across the border from Buffalo, New York. The five-day Superior Fall Colours of Ontario Experience tour departs from Toronto and heads into the forests of Lake Muskoka cottage country, a favorite escape among city dwellers, before continuing north to Sudbury. There are excellent views of the Canadian Shield fall foliage from the train, which stops for several heritage experiences, including a nickel-mine tour, a lunch cruise on Lake Muskoka, and visits to museums, before returning to Toronto. The View: Cross rivers and cut through forests in the area surrounding Lake Huron's Georgian Bay. Peak Color: Usually late September through early October. Check the fall foliage report for details. Cost: $895 CDN (about $868 USD) per person for the five-day, four-night trip with departures through December. The package includes nightly hotel stays, all attractions, meals, and transfers. VIA Rail's last-minute Express Deals include discounts of up to 50 percent off.